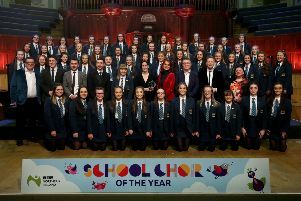 Lisburn Band, Dynamic Brass won the Grade 4 Section, at the 99th Championship of Ireland Bands’ Contest, run by the North of Ireland Bands’ Association, in the Market Place Theatre, Armagh on Saturday October 22. The Harry Brittain Memorial Trophy was also awarded to Dynamic Brass Conductor Harold Whan. Playing the set test piece, ‘An English Suite’ by Michael Ball, Dynamic Brass gave a solid performance, with good energy, that the adjudicator Steve Sykes, recognised in his remarks as a very difficult piece for a grade 4 band. Sir Jeffrey Donaldson MP was one of the first to congratulate the band, on social media, following the announcement of the results, shortly before lunch time on Saturday: “Delighted to congratulate Harold Whan and all the members of Dynamic Brass on winning Grade 4 at the NIBA championships today. Having only been formed three years ago, it is a testimony to the sheer commitment and musical ability of the band that they have progressed so far in such a short time. Well done to you all” Band President, Alderman William Leathem was also quick to congratulate the band online. Thanks to new band sponsor, The Signature Works Bangor, Dynamic Brass not only sounded well but looked well at the contest, with new shirts and jackets being worn for the first time on the day. Dynamic Brass is a community band, rehearsing every Thursday in Low Quarters Hall in Maghergall and are always delighted to welcome new members, of all ages, from all sections of the community. They currently have vacancies for trombone players in particular, but any brass player will be assured of a very warm welcome. There is also a Dynamic Academy for brass learners each Thursday, commencing at 6.30pm. Please e mail dynamic.brass@yahoo.co.uk if you would like to make enquiries about joining or would like to book the band for an event.